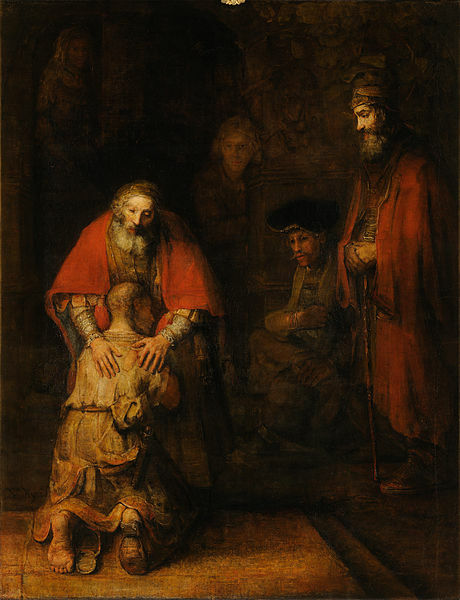 I never understood the story of the Prodigal Son. Well, I understood the parable of the actual lost son and his father, but I live in certain circles, and in certain circles one comes quickly to think that the story of the story of the lost son is really about his older brother. Now the older son had been out in the field and, on his way back, as he neared the house, he heard the sound of music and dancing. He called one of the servants and asked what this might mean. I did not grow up with the material wealth that makes inheritance a meaningful concept, but I did grow up with siblings whom I adored. I could not understand valuing anything more than my siblings, and I certainly could not imagine feeling entitled to get more from God than others who weren’t entirely perfect. I have struggled to understand those who feel sincerely hurt by God because they believe that their good behavior entitles them to a spouse or health or a house or a child. I never knew what to say to one who thought herself cheated when people who have apparently lived less virtuously enjoy the blessings which she was denied. I knew firsthand that it can sometimes be a challenge to celebrate with those who have what we do not, but I simply could not grasp the suffering that comes from thinking that God owes one something. But then a month or two ago I started thinking about how dreadfully unfair my husband’s life is. He has done everything right, and yet instead of getting the natural positive consequences of his choices, he spends his days paying for the sins of others. One day I told him that I thought it was ridiculous that one person in particular was able to do the wrong thing with no consequences while my husband–who did the difficult, correct thing in that same area of his own life–now literally pays the bill for this other person’s selfish decisions. My husband told me that he believes that the other person does pay in another way. I told him that I understand in terms of eternal consequences, but it still seems absurd that reality here and now does not match up with are actions. He responded that he believes that the other person is suffering now, we just cannot know about it. Perhaps even the person suffering does not realize that he is suffering, much less that he is suffering for his sins. And suddenly, I got it. I understood it all. My husband lives with God here and now. He truly believes that being “here with me always” in God’s presence is of utmost value, and that to choose anything else, even for a period of time, is to pay dreadfully for one’s choice. Because he lives with God, he does not notice the practical injustice of his life and the fact that he is virtuous without reward. He would vehemently insist that virtue is, in fact, its own reward. In fact, I know that when he reads this post he will think that I am making him look too holy, because this is just the way that he lives. Somehow, I now understand. I see why people feel that the reality of goodness without reward is unfair. I also see why it does not matter at all for one who truly lives with God.